Inspired by the ease and success of a recent Tofu and Pork Skillet Lasagna, I opted to allow Pinterest to continue inspiring my kitchen creations and also to use up some lasagna noodles and complimentary ingredients I had at my finger tips. As with the skillet lasagna, I opted to use tofu in this recipe simply because ricotta is difficult to track down in Korean markets and while I'm not opposed to either a) tracking it down nor b) making it from scratch, I'm equally satisfied with tofu as a substitute and since I was trying to put together a quick meal I figured the best bet was the ingredient which could be gathered from the small grocer at the bottom of the hill. In a large pot, brown some ground or finely chopped pork (about 1 lb). 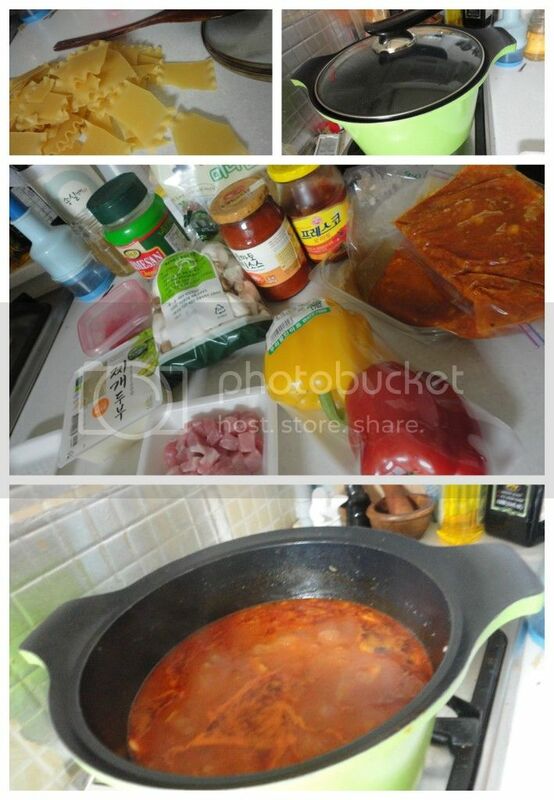 Once browned, add a bit of olive oil if there is a lack of pork drippings and saute a chopped onion and bell pepper. As the onion and bell pepper begin to soften, add 2-3 minced garlic cloves shortly followed by about a cup of chopped mushrooms. Once this first set of ingredients is sufficiently sauteed and cooked add a jar and a half of pasta sauce and/or homemade tomato sauce (or tomatoes and tomato sauce would be a reasonable substitute about 4 cups total) and additional water or broth until ingredients are sufficiently covered and a bit of extra liquid remains. Bring to a boil. Meanwhile, break apart 8 or so Lasagna noodles. Add noodles to boiling soup and let cook until al dente adding water or broth as necessary. While noodles are cooking, prepare one large package of tofu by draining off the water then crumbling as much or as little tofu as you like. Once noodles are cooked through add the tofu and cook for a couple of minutes until the entire dish is heated. Serve with mozzarella cheese and crusty bread. Enjoy with the greatest of friends before enjoying some ruckus game-playing!